Home for the Holidays. It can mean so much to the mobile, military family. Sometimes it means having your spouse beside you as you celebrate a quiet Christmas, just the two of you. It can mean jumping in the car and travelling thousands of miles to be home with Mom, Dad, brothers and sisters. Then there are the holidays when your kids surround you as the anticipation mounts for such a fun day all the while talking with their mom or dad on Skype while they serve over seas and in foreign lands. So tell us: What does 'Home for the Holidays' mean to you? There are no right or wrong answers. Hickory Farms wants to honor a military family with a Home for the Holidays gift box for one lucky winner, valued at $59. We will draw a random winner on December 17th. After you answer our simple (yet so complex for the military-family) question be sure to check-out additional opportunities to have your name in the drawing. ''Our Letters to You" is a military-family blog. Therefore, this contest is meant to honor our military-families. Please enter only if you are a military family, or you plan on giving your prize to a military family. If you are a winner you must be willing to send us a mailing address for your prize no later then December 18th. If we don't hear from you we will select a new winner on December 19th and original winner will no longer be eligible. Knowing that our 8 children will be without Daddy for a whole year starting next month....we are making this Christmas a good one! He wont be here next Christmas so we got 2 trees this year....we are having our next Christmas with this Christmas.....making our memories last for our children!!! We are sad, but excited. Merry Christmas everyone!!! As an Air Force Brat and Army Wife 'Home for the Holidays' means so many things. Many times it just means "if only in my dreams" but it is always surrounded by loved ones and often spent thinking about those that we all miss. I'm a mom rather than a wife, and our family is looking forward to our sailor coming home on leave. He has been forward deployed in Japan for two years and the holidays are the only time we are all together. Home for the holidays means being with the one you love know matter where you are... I'm so thankful my husband will be home this Christmas as he was in Afghanistan last year! Having everyone home for the holidays is the most important part of Christmas. Everything takes a back burner when you are missing a loved one. I'm the daughter of an Air Force man (natural father) and a a Navy man (adopted father), sister of an Army man (brother), spouse of an Army man and most importantly a former soldier myself (U.S. Marine Corps) Family, to me, is knowing that we all proudly serve under the same relative - Uncle Sam! I know for our family, home for the holidays means where ever the Navy takes us is our home and that's where we make our holiday memories at!! This is our first Christmas apart and we have two young boys... were trying to keep the traditions going even though dad is away! This is amazing Hickory Farms is doing this!!! I will definitely be a forever customer! My husband and I have been married for almost 4 years and almost every year he is gone leading up to a holiday. He typically makes it home in time for the actual day but this year is our first year where he is missing both Thanksgiving and Christmas because of a deployment. He will be coming home soon, so that is the joy that keeps my holiday spirits up! The phrase all I want for Christmas is YOU has never been more true in my life! Home for the Holidays means being in my home, surrounded by my pups, baby, and (hopefully) husband, with our own little family traditions. We always have anyone who doesn't have somewhere to go over for Christmas dinner, and spend the day with our Air Force family! Just spending time together with people you love - whether it be your blood relatives or your military family. It means getting to go "home" where I'm from and where our parents still live. The Journey is my home; so wherever I am, I will be happy. For me, it means going home to where my family is. Thank you for this amazing opportunity. 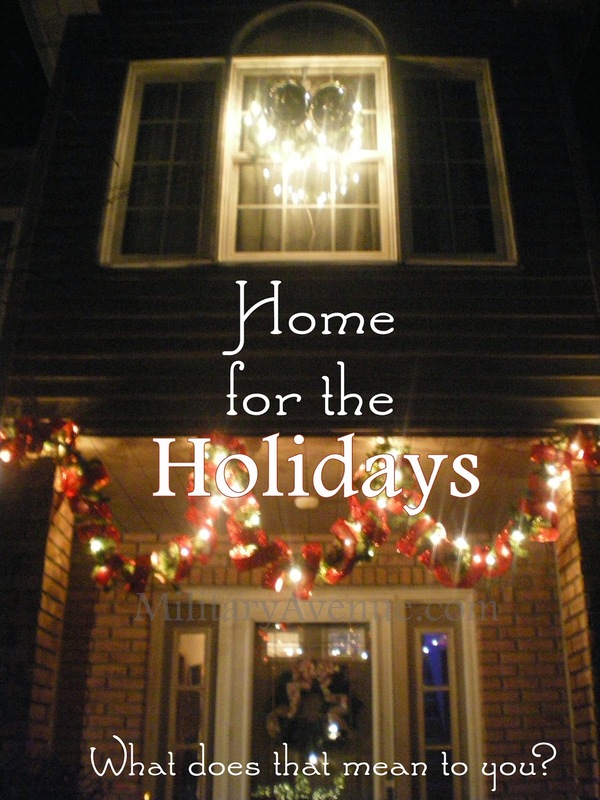 As a Navy Veteran & an Army Wife I know all about the "Home for the Holidays" saying. Home is where the heart is and my heart is always home for the holidays. This is my favorite time of the year. "Home for the Holidays" to me means not only our family being together at some point, but more importantly being at peace in our own hearts, bound together by the love and appreciation we have for our families and friends, no matter where they may be. If home is where the Air Force sends us, "Home for the Holidays" just means that the 5 of us are together. Since my almost 19 year old graduated high school in May and next Christmas my husband is scheduled to be in Qatar, this Christmas we will all indeed be home for the holidays... perhaps for the last time for a while. it means family and friends getting together on Christmas day. our family has grown so much that i dont get to see most of my nieces and nephews except on holidays, so i love catching up with them and reconnecting. Home for the Holidays means being with family, friends and pets. Safe and warm around the Christmas tree. I would love to win this for a soldier I know who does so much for all of us and works so very hard. Home for the Holidays means spending our holidays with family. Our lives are so busy holidays give everyone a period to just relax and enjoy each other's company. 19216801 Solidly one can oversee Security Options, Network Management, IP QoS, DNS, intermediary, LAN, WAN, WLAN settings, DSL, ADSL, MAC, WPS hinder; among others. its amazing website,thanks for sharing detail..